Kiwis are noted fruits of New Zealand, although they are actually native to China. Most cultivars of the classic fuzzy cultivated kiwi are not hardy below 10 degrees Fahrenheit (-12 C.); however, some hybrids exist that can be grown in most zones across North America. These so called “hardy” kiwis are much smaller than commercial varieties, but their flavor is outstanding and you can eat them skin and all. You must plan on hardy varieties if you wish to grow zone 6 kiwi plants. Kiwi are outstanding vines for the landscape. They produce beautiful leaves on reddish brown stems that add ornamental appeal to an old fence, wall or trellis. Most hardy kiwis require a male and female vine to produce fruit, but there are is one cultivar that is self-fruiting. Zone 6 kiwi plants take up to 3 years to begin producing fruit, but during this time you can train them and enjoy their elegant, yet vigorous vines. The size of the plant, hardiness and fruit type are all considerations when selecting kiwi fruit for zone 6. Hardy kiwi vines require full sun, although a few shade tolerant varieties exist, and even moisture to thrive and produce fruit. Too much moisture as well as long exposure to drought will affect production and vine health. Soil should be fertile and well draining. A site with at least half a day of sun is necessary for growing kiwi in zone 6. Choose a site with plenty of sun and where frost pockets do not form in winter. Plant young vines 10 feet apart in mid-May or after all danger of frost has passed. Kiwis in their native habitat will naturally climb trees to support the heavy vines. 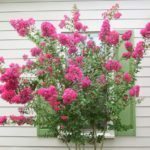 In the home landscape, a sturdy trellis or other stable structure is necessary to support the plants and keep vines ventilated while elevating fruit to maximum sunlight for proper development. Keep in mind vines can get up to 40 feet in length. Pruning and training the first years is essential to create a strong horizontal frame. Train the strongest two leaders to the support structure. Vines can get large so supports should ideally have a T-shape form where the two leaders are trained horizontally from each other. Prune 2 to 3 times during the growing season to remove non-flowering lateral stems. During the dormant period, prune out canes that fruited and any dead or diseased stems as well as those that interfere with air circulation. Fertilize in the second spring with 2 ounces 10-10-10 and increase annually by 2 ounces until 8 ounces are applied. During the third to fifth year, fruits should begin to arrive. If you are growing a late fruiting variety that may be exposed to freeze, harvest fruit early and allow it to ripen in the refrigerator. 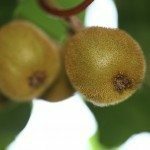 The hardy kiwis come from the Actinidia aruguta or Actinidia kolomikta cultivars rather than the rather tender Actinidia chinensis. A. aruguta cultivars can survive temperatures that dip to – 25 degrees F. (-32 C.), while A. kolomikta can survive to – 45 degrees Fahrenheit (-43 C.), especially if they are in a protected area of the garden. Kiwis, with the exception of Actinidia arguta ‘Issai,’ require both male and female plants. If you wish to try several cultivars, you only need 1 male for every 9 female plants. A particularly cold hardy plant that is also shade tolerant is ‘Arctic Beauty.’ Ken’s Red is also shade tolerant and produces small, sweet reddish fruit.